Dane is the Biggest Loser that I blogged about a few days ago. 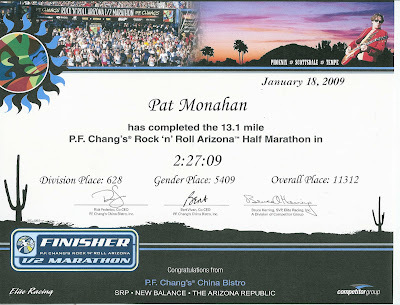 He claimed to have run an entire marathon here in Arizona, when in fact he took a ride for at least 3 miles. His time was near 6 hours, but the producers claimed he ran a 3:53 marathon. If you look at the show video you'll see the five looks like a three. I thought the show doctored the footage. But, being the amateur journalist that I am I went and looked at the Arizona Road Racers pictures. The one above was taken by Hal Gensler. I cropped it and blew it up. You can click on it and see the clock's five does indeed look like a three. So, the time error could indeed be a random mistake by someone back in a studio in California. Today's Graph - click on it to enlarge. First of all, I love RunningAhead, Garmin and Sporttracks. My routine was to run with my garmin and then download the info to sporttracks. Then I would manually enter my data into RunningAhead. Then I would blog about it. Eric over at RunningAhead has been working for the last two years so that guys like me can download from garmin right to his software. If you are familiar with the Runner's World online training log, then you know RunningAhead. It's the same thing. RW uses Eric's stuff. Now I don't have to enter the data into RA. It does it with a click on a button and I get a cool graph like above, a map and my splits. The graph above is my run tonight. Played softball at 7:30. We lost by one in the last inning. Yeah, I was the pitcher that gave up the winning run. Then I came home and ran my 3 miles. It's in the mail. I just got my completion certificate. It's official. Hey, these are the official pictures of me. Running a Rock N Roll event? Here's some discount codes. Rock 'N' Roll phoenix 1/17/2010 save $15 code: Urock. Reveille, the producer apologized for the short marathon. I can't believe that they would pick him up for 3 miles and drop him off 6.2 miles from the finish line. I could believe that they would drop him off a mile from the finish line or less, but not that far. I'm not buying. Sorry, Reveille. If I were in charge, I would have simply paid to keep the finish line open. Or I would have paid to have it set up in a parking lot, if there permit wouldn't let the first option happen. ARR could have used the money and I would rather fabricate a finish line than lie about the complete run. The Arizona Road Racers have a supply of Champion Chips to loan at their races. Chip #292 is famous because it is the chip that was worn for 23 miles by The Biggest Losers, Dane Patterson. Then it was worn at the Heart & Sole 5k in Goodyear Arizona. A race I ran in. Funny, I was 289 - just 3 off the coveted chip. The next race is the Litchfield Park 10k & 5k on March 7th. My guess is it will be in the 10k and the runner will finish with a time of 58:25. I guess I created a game here. Pick the race and the time you think chip 292 will be in and the closest guess will win a $5 Starbucks card. And my guess is like the double zero on the roulette wheel. It counts for the house. I ran a marathon tonight. Actually it was 4.67 miles, but I felt like I could run 26.2 and that counts if you ask the producers of 'The Biggest Loser'. Did you see Dane Patterson get eliminated from the Biggest Loser tonight. An Arizona contestant who I was rooting for. Disclaimer - I still am a Dane fan, I blame the producers. After he got eliminated he ran the January 31 Desert Classic Marathon here in Phoenix. He ran with his wife and BL was there to film it. However, they ran out of time, so the film crew drove the pair to the finish line for a photo moment. So, they only ran 23 miles. Now, hopefully they went back out to the point they stopped and finished the marathon. I'd count that. On the show tonight it said that Dane ran the 26 mile marathon in 3:53. Did he run 23 miles in that time? Did they just project out the time, as if he ran it? I read a blog of a runner that did finish it. Found it courtesy of Obrats. She finished in 6:14. She ran every inch of the course and she said that the pair were behind her. Now, I was telling my wife that I was going to quit running. If a 400 pound man, granite he lost 100 before the marathon can run that fast in just 3 months time, then I'm not much of a runner. I should just quit. Now, I know the secret. Have my wife pick me up in her mini van. I could run marathons every day. Here's some interesting places to visit. Desert Classic Marathon 2009 Results. - Dane was bib # 292. No, you won't find him. I'm proud of the Arizona Road Racers for not listing him as a finisher. Melancholy Smile Race Report. Congratulations you are a MARATHONER! Read the last paragraph of the race report and then look for Dane's wife's comment. I give her props for being honest. I don't think Dane was in on the fix, so he should still be consider for the Hall of Fame. I doubt NBC really knew. It's the producers that try to sell us gum and yogurt to lose weight. I do like the zip lock bags, though. I just left a comment on Runner's World online. It was to a new runner that was having trouble losing weight. I've gone from 260 to 210 by running. 1. Don't eat gels or drink gatorade for your runs. They are too short and you'll congest as many calories as you'll burn. 300 calories in, 300 calories out will not make for weight loss. It'll make for a good run and you'll get fitter, but won't lose weight. 2. Eat less carbs. No bread. No sugar. No sodas(sugar). No candy. No pasta. Get your carbs from veggies. Oh, no ice cream or desserts. 3. Run til you can't run anymore. Then walk for 2-5 minutues. Then run some more. There's no sin in walking, if it allows you to extend your workout. 4. Slowly increase your mileage each week. 10% per week is a good plan. 5. THIS IS THE MOST IMPORTANT POINT. Make sure you are having fun. Run in parks. Around stadiums. Up mountains. In races. Take pictures. Along lakes or rivers. Run with friends. Run alone. Run down a parade route by yourself. Streak. Do whatever it takes to have fun, so that you can't wait to run tomorrow. Good luck, the pounds will come off. Yes, I did everything above. I even ran everyday for 26 days in a row. I hope that's what they thought I meant when I said to streak. Oh well, either way is good as long as you're having fun. What do you think? Anything I should have added? This morning's 5k was at the site of the Brand Spanking New Goodyear Ballpark in Goodyear, AZ. The spring home of the Cleveland Indians and future spring home of my Cincinnati Reds. Lots of Indians fans, but the home opener next Wednesday is not sold out. Tickets are from $12 to $80. I think ticket prices are way too high at all the Cactus League stadiums. It's cheaper to go to a regular season game. Which is why I haven't been to a spring game since Ken Griffey Jr. was a mariner. Hey, I guess I can go again now. Anyone visiting this blog for the baseball pics, can skip down to them. I talk a lot about running on this blog. I ran the 5k and was about the 10th person over the start line. And about the 100 person over the finish line. My garmin split for the first mile was 8:16, the fastest one mile in my racing life. My first half mile was at 7:46. I tried to keep up with the rabbits, but it wasn't to be. My second mile past the practice fields was at 9:43, much more like me. My third mile was at 10:22. I think I had one walk break during the second mile and a couple in mile three. That first mile was getting to me. But, I rallied to do the home stretch in 7:28. The Scorpion Cheer squad cheered and I got a finishers ribbon. Finish time was 29:16. Just 27 seconds from a PR. The sculpture outside the stadium. It's 60' 6" tall ( the distance from home to the pitchers mound) and is supposed to looks somewhat like a planes wing. Goodyear/Phoenix airport is right next to the ballfield. This picture makes it look like a bat, but that's not the intention. If they would have made it out of used tire rubber, then it would have represented Goodyear even more. Down the third base side of the ballpark are Reds photos. On the left side are the Indians photos. I asked a stranger to take my picture. He said sure, so I asked him if he was with the city. Turns out he's with HOK, the builder. They introduced him during the ribbon cutting ceremonies. See the ball in midair? From centerfield. It's a nice facility, but Camelback Ranch, the new home of the Dodgers looks better. Run a 5k, go to the ballpark and have a dog and a beverage of your choice. It doesn't get any better. *A side note - as I walked around the facility in my Reds attire, about a dozen Indians fans mentioned I was a year early. I am spending today and tomorrow in a real estate class on negotiations. Negotiating is the most important skill your REALTOR can offer you. Here's a video we watched. 5.44 miles in a little over an hour. I found a nice little 2 mile loop in Fulton Ranch. Afterwards I played two softball games. We split. The idea of TSTR is to have it race in all 50 states and all 7 Canadian Provinces. So, men who's next? The Men's Shirt that Races! Nikemom has a women's shirt that races and it has been to 10 different races. Now there is a Men's Shirt That Races. I get the honor of being the first runner to wear it. Most likely I will run with the shirt at the Chandler, AZ Ostrich Festival 5k on March 7th. The course is the parade route in downtown Chandler. Then, we'll take in the parade and other festivities. Maybe, even have an Ostrich burger. Now, if you'd like to run in this shirt too. You can. Just drop Nikemom a line and let her know when you can race. I'll make sure I wash it before I send it to you. I ran 3.75 miles yesterday. It was my first run since my record setting half marathon. I've gone from the 26 day streak to running every other day. I'm hoping to do 6 miles a run, every other day with a long run on the weekends. I plan to spend the next 2 months losing weight and getting my long runs up to 20 miles. This saturday is the Goodyear, AZ Heart and Sole 5k at Goodyear Park. That's the new home of the Cleveland Indians and Cincinnati Reds. Being a big Reds fan, I'll be wearing my Reds hat and shirt for the run. Yeah, I'll have pictures. Hopefully, the stadium will be finished in time. The Indians play their this year. The Reds start next year. The sculpture is 60 feet 6 inches tall, the same distance from the pitcher's mound to homeplate. When we plant palm trees the frowns are tied together until the roots take hold. Then, the string will brake on it's own and the trees will look normal. You learn something at every race. Yes, you do. You learn something at every race you run. I hadn't run for three days and my legs were fresh. Real fresh. This is a tale of what you learn when you go out fast in a half marathon. The day started with a beautiful sunrise over the Superstition Mountains. I got my picture with the Lost Dutchman himself. He wouldn't disclose were the his goldmine is. After all, it's the gold that's lost, not the dutchman. Right around 7:30 the gun sounded and we were off. Actually, we waited as the faster runners were off. At this time I commented to all around me, "there goes my PR." But eventually we did get to run and it was less than a minute wait. That's the Superstition Mtns. in the distance. Only about 700 runners in the half, so I didn't have to do a lot of weaving. The first mile split was 9:47. My goal was to see how many miles I could do under an 11 minute pace. 1:13 seconds was way too fast, but my legs wouldn't let me run any slower. The second mile was 10:12. More reasonable, but still on the fast side. That made me 2 for 2 goal wise. I was a bit worried that it would get me later on. This course is half paved, half dirt road with lots of small hills. Mile 3 was 10:59, perfect and mile 4 was 10:42. I felt like I was getting in the groove. Maybe it was the site of the medals before the race that got me in a fast mode. There were lots of medals. I got the HM one on the right. Before the race I got to meet Alissa from Fountain Hills. She's one fast runner and it would be the last time I saw her. Mile 5 was done in 9:58. Don't ask me. I have no clue as to why I was going so fast. Mile 6 was done in 10:06 and I was cruisin' to the half way point. Then came mile 7. My first one over 11. I did it in 11:07. Was the first six fast miles catching up to me? I did the 10k in 1:03:47, which would be the fastest 10k I ever did. I did the 6.55 in 1:08:01. That mean't I had 2 minutes in the bank. I was hoping to do 1:10's each way. Then came mile 8. I was trying to walk thru the water stations. I did it in 10:26. I skipped some stations and this mile most have been one of them. Mile 9 was my second mile over the 11 goal. It was done in 11:27, my slowest mile. I think it was the mile that I saw Lobster Girl. Two years ago I ran behind a girl in a lobster hat for a long time. I even took a picture and she happened to be in it. I recognized her this year. Asked if it was her and we talked for awhile. She's done 8+ marathons and can't even remember how many halfs. And she's young. I was a bit jealous. Mile 10 was 10:43. Mile 11 was 10:58. Mile 12 was 10:27. During these miles I got to talk with a guy from New Mexico and a gal from Minnesota. We all got in the leap frog mode. When I walked, they would pass me. When they walked, I would pass. Sometimes we would chat. The gal from up north eventually passed me for good. Not sure about the guy. But, I still had 1.1 miles to go and my legs weren't as fresh as 2 hours ago. Mile 13 came in at 10:25. I did a lot of walking, but I was running in the 9's and I was holding up pretty good. Good enough to sprint to the finish line at an 8:50 pace. I stopped my garmin about 5-10 seconds after I finished. 2:19:52 is 7:17 better than I ran PF Chang's 28 days ago. It was 7:23 better than I ran London's Run 15 days ago. It is the fastest Half Marathon I've ever run. It was a great day. No rain. Sunshine. High 40's to start. Mid 50's for most of the run. The third HM in less than 30 days. Two of them for PR's. The 11th HM of my life. 11 of the 13 miles under 11 minutes. A cool medal. A cool t-shirt. If only the Dutchman would have shared where the gold is. 57 degrees and sunny. I went for a run/photo session around Tempe Town Lake. This is what's left of the old tempe bridge. The view from the Tempe Arts Center with it's zero edge pool. Along the lake path are all kinds of art work. This one and others were called windows. The view from the western most point on the trail. Can you see what this sculpture is made of? The big wigs to be announced that the dams up river are at capacity. So, now we have to start letting the water run free. Which means it won't be used, it'll just flow down the dry river bed. This is the adjustable rubber dam letting the water go. Downtown Phoenix in the distance. You can see the Diamondbacks stadium to the left. Snow on the mountains. That's Four Peaks and it's the closest mountain range that gets large amounts of snow. You can see it from the east valley. Oh yeah, I got 3.1 miles done. Mostly running, but lots of stopping to snap pictures. 35 minutes. I'd cut my leg off to run! I got to run in the rain today. It was overcast, around 60 degrees and windy. Who knew the weather could be like that here in Arizona. I liked it. And you can tell by my splits. I decided to keep near home, just incase the heavens opened up. Right around the 2 mile mark it started to drizzle. Didn't last long, so I kept on running. Legs felt great, hip felt great. 6 miles done in almost an hour. Yeah, you've heard that before. But, here's a guy that meant it. I'm one week from the Lost Dutchman Half Marathon. It'll be #11 for me and the second time I've run the event. Remember back in 2007 I lead the LDHM at the 2 mile mark? This is a beautiful race, run at the foot of the Superstition Mountains. Here's some pictures from the 07 race. After this race, I am adding a 5k on the 21st. It's in Goodyear, AZ and it will start and finish at the new ballpark. The spring training home of the Cleveland Indians and Cincinnati Reds (2010). Since, I'm a Reds fan I had to do it. If your goal is to run for life or into your 60's, 70's and 100's then this is a great book full of advice on staying injury free, eating right, maintaining weight and enjoying the sport. I've decide to incorporate several things in this book. One, running every other day. If you want to do high mileage, Galloway advises to do less runs, but longer. Better to do 3 five milers than to do 5 three milers in a week. Your rest days are very important to an older runner. I learned this somewhat from doing my 27 straight run days. Galloway is most know for his system of run/walk/run in all his training and races. Remember Galloway is an Olympic runner, but he still takes walk breaks so that he can maintain his current running level. I've always taken walk breaks, except for a few 5k races. At my last half marathon Nick and I tried to take a walk break for 30-40 seconds every 4 minutes or so. It worked great. I will continue to take walk breaks, but will shorten them. I've been know to take 2-3 minute walk breaks. Speed work and hills. I plan to do more of these. My past speed work has been a serious of tempo runs in the middle of a relative easy run. Galloway calls these Acceleration/glides. I would increase my pace to 8-9 mpm and hold it for as long as I could. Then take a walk break and do it again. I'll continue to do this and incorporate running up gradual hills. I can do this at South Mtn. park (main entrance) or Discovery Park in Gilbert. Weights and pool running. I want to start running in the pool and lifting weights at least twice a week. Galloway and others think that pool running is very beneficial to a runner without the wear and tear. I highly recommend this book and plan to get other Galloway books. Decide to run east toward a shopping center that has a lake. The lake has a mile long path around it. It was 70 degrees and beautiful outside. Ran on a major street going out, but found this hidden path going home. On one side was a wall with a subdivision on the other side. On the south side was a large home with pandas grazing in the field. Down at the bottom of this post is an aerial of the panda ranch. It was shoe horned in between two subdivisions. That long grass area belongs to one owner. I ran 5 miles in a little less than an hour. It was a slow run/walk/run, but my legs felt great. My hip felt fine. It's a business book about hospitality in the restaurant business. His restaurants in NYC include Union Square Cafe, The Modern at MoMA, Gramercy Park, Blue Smoke, Tabla and the Shake Shack. I like to read books about customer service and hospitality because it helps me to be a better REALTOR. He calls it the final chapter or what you do to make up for a mistake. He says to do something creative after a goof, so that the client telling about how you screwed up will, also, have to include how you rectified the situation. Satrapi is an Iranian woman that grew up during the Islamic Revolution (1980's). The book is written in comic book form. A first for me. My wife recommended it and I read it in three days. A good book that I probably wouldn't have read otherwise. Give me a book and tell me to read it and I'll at least make an attempt. I'm easy that way. I just started keeping track of books in Goodreads. It's a website that will recommend, list and keep track of books read and books you plan to read. It lets you write a review and you can make that public for your friends and family to read. Chad had mentioned that he helped make the final selections for "Chicken Soup for the Baseball Fan's Soul" , a book that I have been reading for some time now. It's a collection of heartwarming stories about baseball in people's lives. From little league to big league, from fans to players. It's the kind of book you read in spurts. I went to the website to see if they have a "Chicken Soup for the Runner" book. They have one in the works and are looking for submissions. Yes, you can write a story about your running and it might be included in a future book. They, also, have one planned for diet and fitness. The Chicken Soup website has a list of all their books, lists future books and you can even get a daily chicken soup story. Speaking of book projects, another one of note is at Runner's Lounge. Amy & Tom are collecting stories to put into a book. It's February folks and 83 degrees. In my pre running days I would have thought it was the perfect day. Or if it was August, I would gladly take anything with two digits only. But, it's February folks. I was out showing homes in Gilbert, so I took my running gear for a run at Discovery Park. It's almost a mile around the perimeter and it has lots of paths in the middle. Like a lot of parks in Arizona it is also a water retention area, so it's down in a valley. So, it has hills. And like a lot of parks in Arizona, it has hardly any shade. I got 3.8 miles done. About 85% running, but it felt like I was walking the whole time. My legs still feel less than specatacular. They must run cross country races here. These are the hoodoos and you could see that many a runner has run them. There were about four hills and they were about 4-5 feet high. Think roller coaster. Did you know that they make championship tees for both teams prior to the Super Bowl? Then they ship out both sets to stores. The stores sell the shirts with the winning team on it. Do you know what they do with the shirts that have the wrong team winning? *I heard this on sports radio, so it could be totally false. I, always thought they were destroyed. Since today was the day the music died and I don't have American Pie on my ipod, I skipped the music. It was the first day running since my last half marathon. My legs felt really stiff. I've not felt that before. I got 4 miles in at about an 11:32 pace. It was 78 degrees, a bit warm. But, a beautiful day. Nick with a strong finish. Did I ever tell I once bid on a piece of bubblgum chewed by the Arizona Diamondback's Luis Gonzalez. It's true. I was even interviewed on a local tv station. I think my bid was around $700. Amy couldn't believe it. My kids thought it was cool. Eventually, I lost out to a guy that paid $10,000 for the chewed gum. It was a way to promote my website - http://www.townhomesonly.com/. I wonder where that gum is today. *I'm guessing on the place. But we did battle pretty hard in the race to the finish.